The Christ in Prophecy Journal: Christian Doctrine: Is It Irrelevant? Christian Doctrine: Is It Irrelevant? Is doctrine irrelevant and an obstacle to Christian unity? Dr. Reagan and I on our ministry's television show Christ in Prophecy had the pleasure of asking this question of Eric Barger of Take a Stand! Ministries. Eric is an authority on the cults, the New Age, and rock music today. From his past as a former drug addict and rock n' roll musician who was deeply involved in the New Age movement, Eric has emerged since he gave his life to Jesus Christ to become a great defender of Christianity in America. He joined us to talk about the importance of holding fast to Christian doctrine in these increasingly apostate end times. 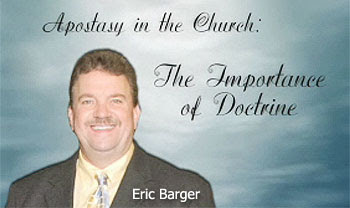 Eric Barger: We see doctrine all throughout the Bible. When the Bible teaches a theme, teaching something to us again and again, it develops over the years into a doctrine. "Doctrine" is not a dirty word, but it has become a dirty word in some circles. A lot of pastors have elected to not preach doctrine, especially topics like eschatology and other things that they believe are somehow too hard to understand. In these end times, we are seeing doctrine being left behind. I am big on the central or essential doctrines of the faith such as the Virgin Birth, the blood atonement, salvation by grace, the inerrancy of the Scripture, the Trinity, and the deity of Jesus. The essentials of the faith have held Christianity together for 2,000 years, and they are the things that will hold us together in times of trouble and distress in this increasingly chaotic world. Doctrine is what we need to be preaching. That is the job of the Church. But, instead, I believe many churches and many pastors who haven't thought their faith through have decided instead to preach the latest plan that man has come up with like the latest book, workbook, or new DVD series. All of those resources are fine, especially the teachings about how to have a better marriage and how to handle your finances. These are wonderful, but they can never equate to the Gospel. We need the solid doctrines of the faith to be faithfully taught to us. I hear some Christians say, "I already heard that doctrine and I don't need to hear it again." But, we need to hear it over and over and over so we can be discerning. I need to hear it, all of us here needs to hear it, and really everybody needs to hear the doctrines of the faith taught repetitively. Dr. Reagan: Well, if we don't teach doctrine, we end up with what we have in Christendom today — ignorance in the pew. The average Christian today simply couldn't give you the scriptural basis for the Trinity, or for the deity of Jesus, or the Virgin Birth, or whatever foundational topic of the faith. There is just a famine of the Word and an ignorance of the fundamentals of the faith. Eric Barger: Concerning the end times, the Scripture teaches like in the book of Amos that there will be in the end of this age a famine of the Word of God. That famine of sound teaching is leading us to what we see happening in our churches, and that is the apostasy of the end times. If we don't know what we believe because it hasn't been ingrained into our thinking, then we will begin to believe all kinds of things that are just not true. We will then not believe or want to discount the central doctrines of the faith. It all comes back to the respect that we hold the Bible in. The honor that we hold the Bible in is the most important thing that we can learn. Dr. Reagan: I have a friend in Lexington, Kentucky named Jean Eason. Jean was a fourth generation Jehovah's Witness. She was also at one time the world's champion in distributing the Watch Tower magazine. No matter how many she distributed, her leaders told her she needed to distribute even more in order to be saved. Jean also told me while she was knocking on doors all over this nation that she was converting Baptists, members from the Church of Christ, Methodists, and Presbyterians. These are people who had gone to church all their lives, but didn't know anything about the Bible. As Ron Carlson, another apologetics minister who recently passed away, once told me, "The average cult person can take the average Christian and twist them into a theological pretzel in just two minutes flat, because the cult person knows what they believe and the average Christian doesn't." Eric Barger: The cults do an excellent job teaching their people their convoluted view of the Bible. Did you know that more people convert from being a Baptist to a Mormon than any other religious group? That says something to us! I believe this mass exodus from fundamental Christianity to the cults is all because our biblical foundation is weak. If there is anything that I preach about in pastors conferences, it's about coming back to the basics and teaching those basics to our people, and also being faithful with what the Word of God tells us teachers to teach. I may not be accountable for all the plans that men concoct around me involving church growth, and unity might be divided when we teach doctrine, but all teachers of the Bible must be accountable to what the Word of God says. What the Word of God teaches — doctrine — could never be irrelevant to God. In the next part of this series on the importance of Christian doctrine, we'll ask Eric why he believes pastors are scared to teach it. So painful to lose a parent. Our comfort is that if they believed on the Lord Jesus Christ, they are now rejoicing with Him. i am so very sorry for you and your family are in my prayers. My heart goes out to you. I have had a few tears on your behalf; but I know, that you know, this parting won't be for too long; and that is such good news. Praise The Lord that your dear mum is also your sister IN Christ who is, for the moment, asleep IN Christ Jesus and soon to be raised incorruptible with you, in the air to greet The Saviour. Keeping you and your family in prayer, Hartdawg. While I do agree with Eric Barger, I have been a little taken aback by his understanding of 'doctrine. The Greek word id ‘didasko’which means ‘teaching’, and a teacher is one who teaches, in this case, the teaching of God. 'doctrine’ after a while. Teaching is what Doctrine is. We mustn’t allow emergent theories to complicate what is a simple fact. Emergent’s are now listening to their pastors doctrine instead of God’s teaching! Sue, I was a tad bit confused by what Eric said concerning doctrine at first, but going over it a few times think he's saying that we give the official label "doctrine" to a teaching of the Bible that's repetitively taught. For example, we wouldn't have the Doctrine of Not Mixing One's Fibers just because it's taught once in the OT. Plus, it has nothing to do with the tennents of understanding God and our salvation. I don't believe Eric's saying that if man teaches something from the Bible then it gets the label "doctrine." Jon, we here at Lamb & Lion continue to pray for you and your family and the comfort and peace only the Lord can provide. I shall 'ave you know that I always live by the doctrine of 'Not Mixing Ones Fibres'!!! Christian Doctrine: What Is Core? Christian Doctrine: How Does Drift Occur? Christian Doctrine: Pastors Scared to Teach?